Europe cannot afford to become a continent of hate. Every time hate is given some ground, any small ground, violence, death, and atrocities are given ground too. 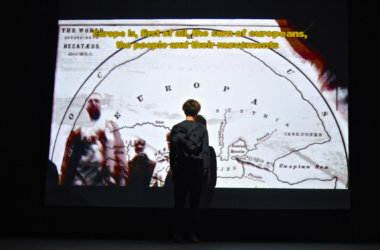 TRANSEUROPA is a transnational festival where debates on specific topics are integrated from the artistic, cultural and political perspectives. The Festival has been organized by European Alternatives since 2007 through a decentralised event structure in more than a dozen European cities and the 2017 edition has been in Madrid. The thematic axes of this year were three: Europe as a refuge, Cities of Change and Urban Commons. In this context, Talk Real invited three key voices to debate around these topics in a conversation moderated by the Greek artist and journalist Marguerita Tsomou with Oliver Ressler, Austrian artist that has been covering migration in his work in the past 10 years; Rasha Shaaban, curator at the Museum of World Culture in Gothenburg; and Lucila Rodriguez Alarcon, journalist and founder of the Spanish organisation PorCausa.org. The conversation moved around how cities are becoming the space where human rights are respected and where art and culture are being used as a political tool for making a social impact. As Rasha Shaaban said, we need art and culture to break the fear that grips us and to break the walls of prejudice we have in our minds. In this regard, Rasha Shaaban is currently leading a project in Sweden called IHopP, a name composed of the Swedish words hipo (together) and hopp (hope). It uses digital narrative to tell the stories of local people and newcomers in the city. For one minute, the speakers talk about their dreams, their travels, their family, their hopes, their aspirations. Simple stories, full of lives, different one from the other, but essentially similar. We need art and culture to break the fear that grips us and to break the walls of prejudice we have in our minds. As part of this exchange, Oliver Ressler brought to the Festival two video works that reflected on the voices that go unheard in this so-called “refugee debate”: ‘Emergency turned upside Down’ and ‘There are no Syrian Refugees in Turkey’. In the first one, the narration text is set in dialogue with drawn animations in black and white, in which overlapping lines form an abstract pattern evoking, among other things, borderlines, migration routes, outlines of states, life-lines and human heart rates. In the second, the speakers are not seen in the film: their anonymity is maintained as a precaution against repression and unwanted consequences of all kinds. The interviews are combined with images made from long single shots taken in Istanbul. The words and images are accompanied by an experimental audio composition –produced specifically for the film – which likewise bears witness to conditions of war and terror and to things left unsaid. Lucila Rodriguez presented, among other ideas, the project el BÖRDERless, a proposal that aimed to give answers to “architectural solutions for refugees”, a UNHCR contest with IKEA. PorCausa decided that the most useful architectural work to do was to actually turn down the fences and therefore, they made a manual of instructions (exactly like those of IKEA) explaining how to do it, with real data on all its materials. Every time hate is given some ground, any small ground, violence, death and atrocities are given ground too. Europe cannot afford to become a continent of hate. Every time hate is given some ground, any small ground, violence, death and atrocities are given ground too. Europe cannot afford to turn a blind eye on the suffering of others. Every time a newcomer is beaten or tortured on its way to Europe, every time a person is mistreated on an expulsion flight or in an ‘administrative detention’ centre, every time a person is left freezing, hungry and sick at its borders, Europe and its people are betraying themselves. They are betraying the ideal of solidarity and peace, they are putting at stakes their own future, one in which one day they may have to ask for support, security and help to those who are less fortunate or less powerful today. They denied to all the people who have left their country in the hope of a better future and a better life, to find at least a better refuge in Europe.